Growing up I spent many weekends at my girlfriend Nancy’s family cottage on Honeoye Lake in upstate NY. 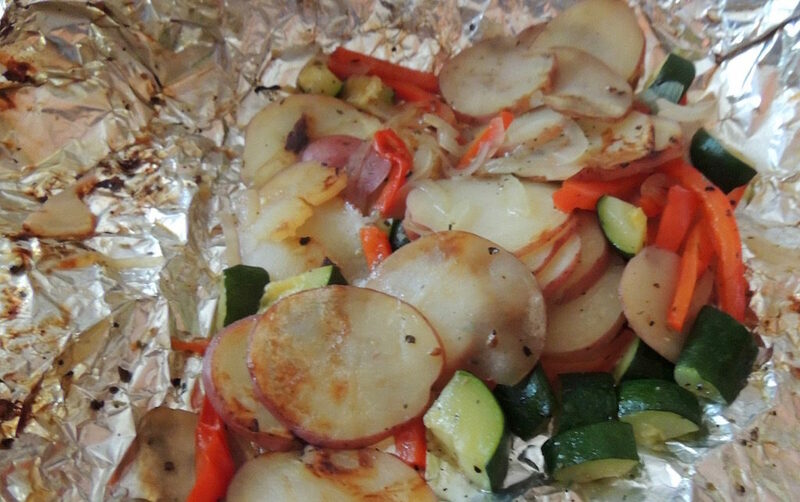 We frequently grilled on the weekend and Mrs. D (Nancy’s mom) made these delicious individual potato packets to be grilled along with the chicken or steak. I never forgot about them and started making them for my kids; they loved them. 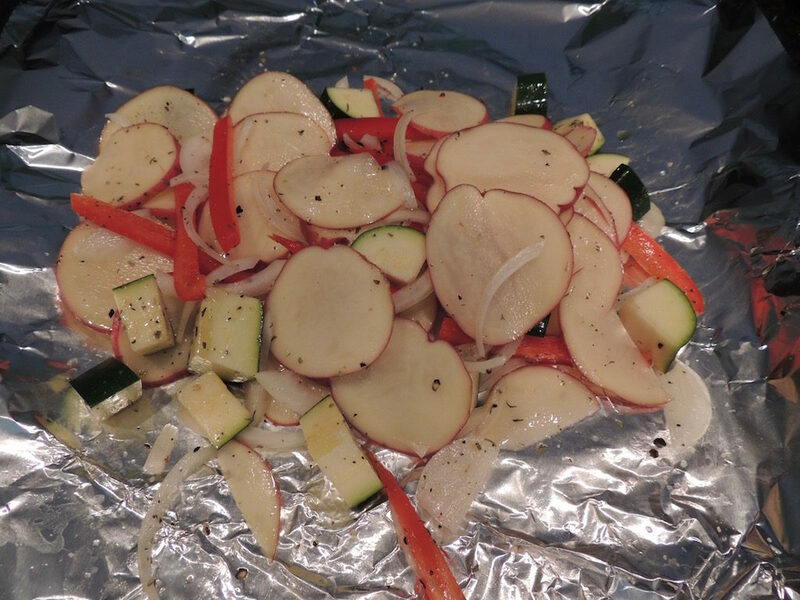 Over the years, I’ve adapted the recipe to include onions and other vegetables and I make them in larger packets. I particularly like red potatoes. Wash and cut into thin slices with the skin on. Thinly slice onion and bell peppers. Cut zucchini in slightly larger chunks; it cooks quickly. Season generously with salt and pepper and drizzle with olive oil. Toss and wrap tightly in heavy-duty aluminum foil. Be careful not to puncture the foil, the steam aids in the cooking and the high heat creates a little caramelization. Turn every few minutes for even cooking. Takes about 15 minutes for large packet. Open immediately otherwise the vegetables get soggy and place in a serving bowl. This is a great summer recipe. Make ahead and keep in the refrigerator. Grill the entire dinner and no pots and pans! Zucchini chunks work well as do thinly sliced bell peppers, but don’t hesitate to add something you enjoy more. The flavors meld together and the potatoes are a wonderful side dish for any grilled meat, fish or poultry! Place two long sheets of heavy-duty aluminum foil on the counter. Pour 1 ½ teaspoons oil in the center of each sheet. Place the potatoes, onion, pepper and zucchini on top of the oil. Sprinkle the vegetables with one half each salt, pepper and bouquet garni. 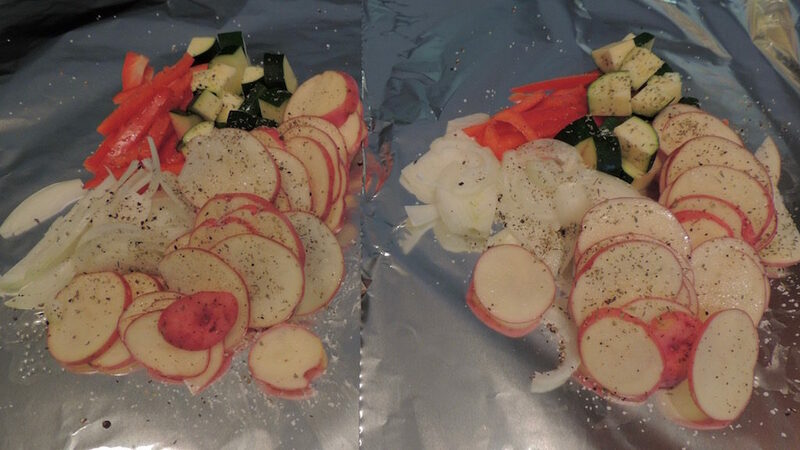 Use the ends of the foil to help you “toss” the vegetables, by sliding back and forth, to coat the ingredients. Bring the long ends of the foil together, making flattish packets for even cooking, and fold the ends over a couple of times for a tight seal, just as if you were wrapping a sandwich. Turn and tightly crimp the ends. Use another sheet to double wrap. Place the sealed side down first, this offers a little protection if you happen to rip the outer layer with your tongs, and repeat the wrapping process. Place the packets on the preheated grill and cook for about 15 minutes, turning every 3 minutes to prevent burning. Use a fork to gently puncture the packet to see if the potatoes are soft. NOTE: The potatoes primarily steam, but some caramelization will occur if your grill is hot enough. Remove packets and open carefully, lots of steam is released. Slide the potatoes into a warm serving bowl and scrape any pieces that stick to the bottom of the packet, they’re tasty! Prepare the packets in advance, just refrigerate until ready to grill. Cook an extra 3-4 minutes to compensate for the cold temperature. Looks good, going to try it. I hope you enjoy it! Long time no see.